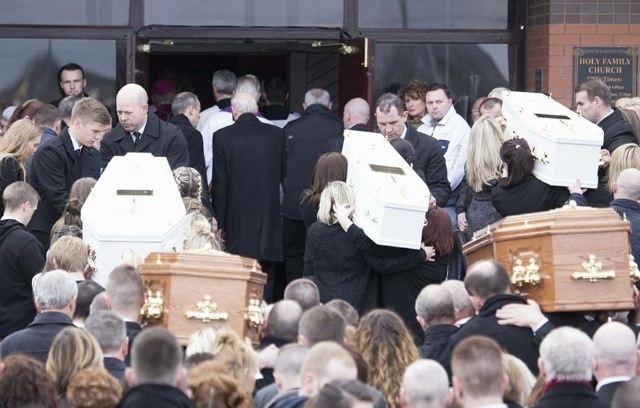 The five victims of the Donegal pier tragedy were laid to rest today as mourners heard how one of the young boys who died told his mother: “Mammy, I miss you so much,” before the accident. The funeral service at the Holy Family Church in Ballymagroarty, Derry, heard how Evan, 8, spoke to his mother, Louise on the phone, shortly before tragedy struck as he watched the sun set for the final time on Sunday evening on the pier. 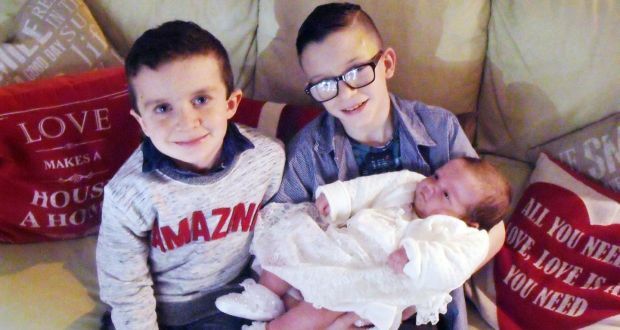 Father Sean McGrotty, 49, perished in the car as it sank in to Lough Swilly, Buncrana, Co Donegal, on Sunday evening, along with his two sons Mark, 12, and Evan. 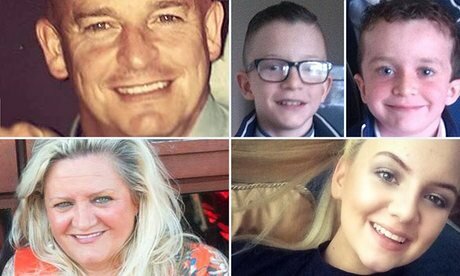 The boys’ grandmother Ruth Daniels, 59, and her 14-year-old daughter Jodie Lee Daniels also died in the car when it sank after it went out of control on the slipway. The sole survivor of Sunday night’s accident in Lough Swilly was Mr McGrotty’s four-month-old infant girl Rionaghac-Ann. Mourners were asked to pay tribute to the bravery of Mr Walsh by Fr O’Kane, who said: Davitt, today we salute you as our hero. Footballer Mr Walsh took hold of the baby girl as her father handed her out of the car window moments before the vehicle sank. The country continues to mourn the loss of the five members of the family. Touching notes and flowers have been left in their memory by the pier and there has been an outpouring of grief on social networks. Were it not for the bravery of one man, the death toll could have been six. Now calls are growing online for Davitt Walsh to be given a special Presidential Award for saving the baby. Mr Walsh swam back to the shore with young Rioghnac-Ann, and cared for the child until she was taken to hospital. A touching photograph was taken of him holding the baby yesterday and placed on the front of the Derry News newspaper. “The water started coming in. Sean just looked at me and said, ‘Save my baby’. And then I took the baby, I held it above my head and I swam back to shore. And that’s what happened,” Mr Walsh told RTE after the tragedy. 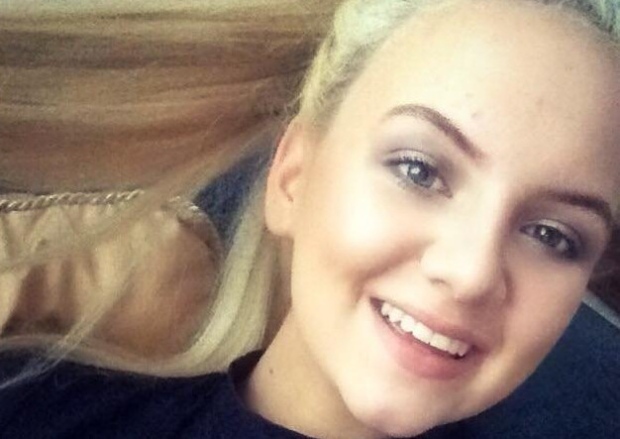 Alice Diver wrote on Facebook calling for Mr Walsh to be recognised for his bravery. Alice wrote: I would like to nominate Mr Davitt Walsh for a special presidential award for outstanding bravery in the face of overwhelming adversity in the rescue of the baby in the Buncrana tragedy. The post has been shared almost 17,000 times with 44,000 likes. And the messages of support have been many and heartfelt: “This man deserves the world and more! !” one poster wrote. “Such a brave kind hearted person who put his own life on the line to save that little baby,” said another. There’s no one in this country that deserves it more than him!. His courage and bravery saved not just a small child’s life but gave a mother a reason to carry on in life.